We have had several customers recently coming to us after having used USB memory sticks* and SD media cards to manage their screens’ content for a while, most of them complaining about the system’s clunkiness and the amount of time required to keep it fresh. For the ones managing screens centrally, refreshing content implied either having to travel to each screen’s location, manually plugging in the USB/ SD card into each screen or having to mail them to each remote location. None of these options were time-efficient nor did they allow instant updates of information. 1) A time- consuming network management process. Whether you manage screens centrally or you allow local control, the process involves a manual operation for each screen. Think of a medium sized-network of 20+ screens and you can imagine the workload involved. If you add the travelling time involved by a centrally-managed network, then the resources consumed will just increase. On the other hand, a cloud-based digital signage software such as digitalsignage.NET used to run those screens remotely would allow you to update all- or a group of your displays simultaneously, without having to travel to- or manually check each screen. The system would also be able to monitor performance, verifying if the screens have played the information sent to them, notifying the network operator(s) when errors occur. 2) Lack of proof of performance. Proving that a certain piece of information has been played at the right time, on the right screen (and thus in the right location) might get difficult if all you’ve got to manage content are USB memory drives and SD media cards. A content management application (digital signage software) would offer automatic reports and detailed data on when and where a certain file or playlist has been displayed, reports that can be shared with different users and non-users of the system. This feature not only enhances the reliability of the system but it’s also decreasing admin workload through the automation of yet another task. 3) A ‘disconnected’ medium. Screens updated by USB’s and SD cards are not only ‘disconnected’ from each other but they’re also cut off from your other digital marketing channels like the mobile, your website and social media. Even though such system can support QR codes and NFC, giving way to a M2M (machine-to-machine) communication, it doesn’t support a real-time data input from your other channels, such as Twitter or Facebook. 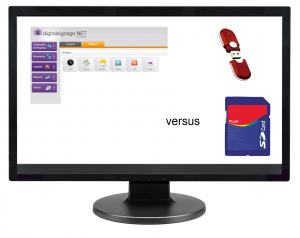 A network of screens supported by digitalsignage.NET would permit the creation of a lasting link between the multiple screens that your audience is already using as well as the input of real-time data without any human intervention. This means that, at times, you only need to update one channel for several others to be refreshed as well, helping you to build a consistent message across all your channels and save time. 4) Dated content (the same information displayed for days or weeks). Because of time & distance constraints and the manual procedure involved, the message on the screens will be far from ‘up-to-the minute’. Repetitive and outdated messages make people switch off and decrease or nullify the usefulness of the system (in the digital world, the standard for ‘data freshness’ is real-time). In the end, why would people want to look at a screen that shows exactly the same things every day or at one that shows information that is no longer valid (thus misinforming them)? A digital signage software would allow any member of your organization that is granted access to the system to ‘freshen-up’ the screens with timely, location- specific information. Fresh and relevant content has the effect of attracting attention, encouraging people to look at the screens when they need to inform themselves about a location-specific topic quickly. 5) The impossibility of scheduling content. When you’re using a USB stick or a SD card you simply cannot decide what content will play when. All the information is bound to be shown every day, all day long until someone manually switches the screen off or replaces the content. Could this be made differently? With a digital signage software you can determine the time and dates during which your information will be displayed and you can modify these setting at any time, remotely. As digital signage is all about timely and relevant information, being able to show different content in different parts of the day is critical to the success of your network. Your digital signage network must be able to reach the standards of your other communication platforms in terms of information freshness and speed if you want it to reach its goals and be taken into consideration by its viewers. A network run via USB drives and SD cards involves the risk of failing to rise up to your audience’s expectations. *NB- The USB drives mentioned above don’t include the ‘smarter’ ones that enable you to connect screens in a network. More on this soon. If you want to find out more about cloud- based digital signage software, set up your own digitalsignage.NET account for FREE. 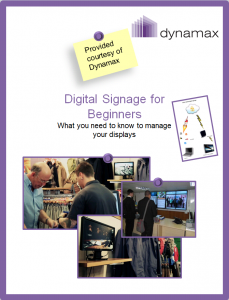 This entry was posted in Tips and advice and tagged digital signage by Dynamax. Bookmark the permalink. These are fair comments but you are talking about a narrowcasting system for shopping centres, big organisations etc. With instore displays, for specific products, an solid state media player still gives the best ROI. Do people really want to stand in a shop and read your facebook/twitter feeds or do they just want the basic product information delivered as quickly and easily as possible? Do customers come back day after day to view your display? I wish! but in reality we only have a few seconds of attention to hook them. Content is still king and even with the cleverest technology you still need training and experience in media. Dom, thanks for your comment. In some environments with high dwell- time, such as waiting rooms in surgeries or lawyer offices people will read your Twitter feeds because they have the time to. So adding those to your screen when you haven’t had any new content for days, freshens it up. I agree that content is king but smaller businesses (like corner shops) most likely lack the resources for hiring the services of professional content designers (who are the ideal ‘go-to-guys’ if you’ve got the money). So they’ll have to create content themselves. That’s why we’re trying to bring a content- creation dimension to our software. To give them a start in creating appropriate DS content. Then if they can, we do advise them to go for professional media services.